COLORADO CITY, Arizona – The 6-acre parcel of land is enclosed on all sides by tall, white fencing. “No trespassing” signs are posted intermittently, and vehicles drive in and out on a dirt road through the only opening in the fence. Beyond the walls, huge, white tents stand in one row and long, white trailers in another. “It’s quite the concentration camp,” Isaac Wyler, an employee and consultant with the United Effort Plan Trust, said. 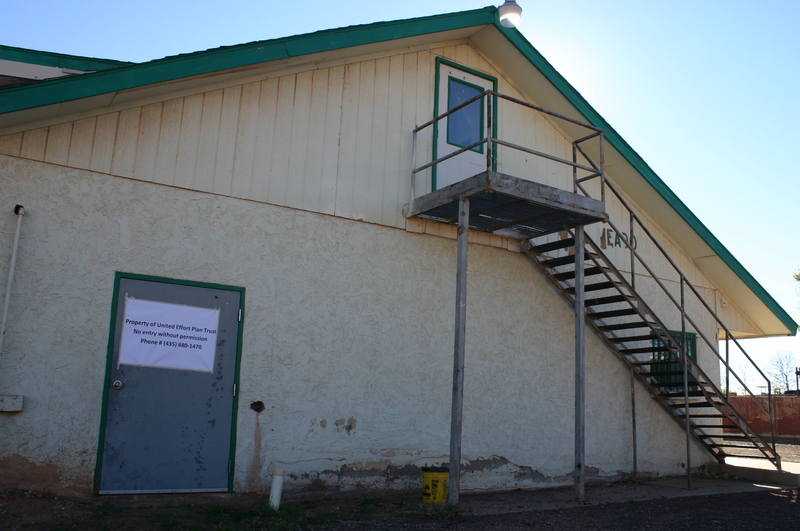 The property, situated between Arizona Avenue and Uzona Avenue in Colorado City, Arizona, is reportedly being turned into a mass housing compound for members of the Fundamentalist Church of Jesus Christ of Latter Day Saints by the local city government. Wyler said Colorado City changed its bylaws earlier this year in order to convert the former industrial park into residential land. 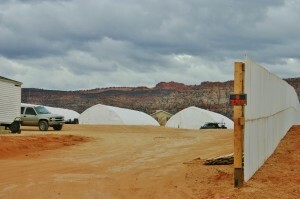 Approximately 19 tents as big as hay barns have been erected, he said, and what he described as “FEMA trailers” have also been moved onto the property; presumably, he said, the trailers will be reserved for FLDS families who are in better standing within the hierarchy of the church than those who will be living in the tents. Lean-tos are also being constructed where the future residents of this tent city will shower, wash their clothes and eat. “That’s going to make me sick when they put a bunch of ladies and children in this tent city in the winter,” he added. The irony, Wyler said, is FLDS people are currently losing their homes simply because they refuse to cooperate with the UEP, which is a trust that was created by the FLDS church in the 1940s but has been reformed by Utah’s 3rd District Court to administer housing solutions and benefits for trust participants. In order to stay in their homes, residents of UEP-held properties must become current on their property taxes and either go through the process of acquiring deeds to their homes or pay a $100 monthly occupancy fee to the UEP. Instead of encouraging FLDS members to cooperate with the UEP, however, church and city leaders are going to great expense to create a communal camp for the evictees to live in. “We only ask them to pay their taxes and an occupancy fee and sign an agreement with the trust, and they won’t do it,” Wyler said. FLDS members are, in fact, forbidden by the church to communicate with the UEP or even read UEP notices posted on their doors that contain information about the eviction proceedings and how to keep their homes. Wyler said the FLDS church has appointed individuals to remove the UEP’s notices and dispose of them whenever they are posted on the doors of FLDS homes. Between nine and 11 notices have been served on each affected home since eviction proceedings began in July, he said, in an effort to get the residents to come forward and work with the UEP so they can remain on their properties. “They get caught reading (the notices), they’ll get kicked out of their church,” Wyler said. 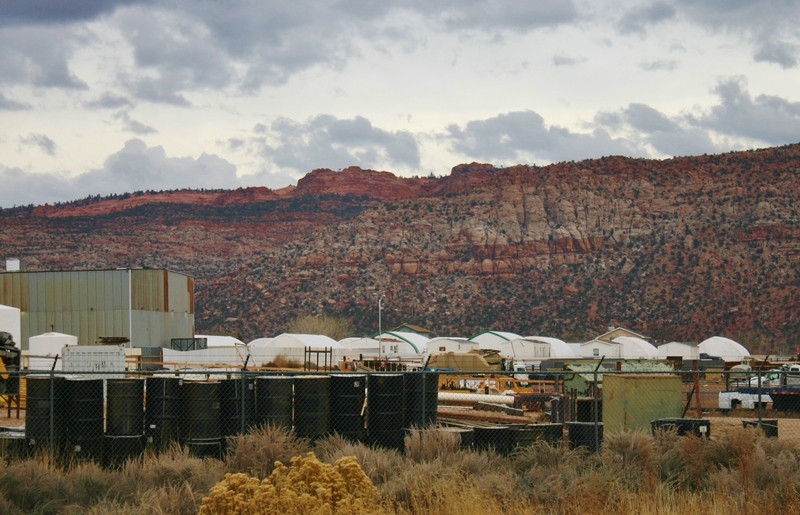 What most FLDS members don’t know, he said, is UEP-managed properties in both Colorado City and the neighboring community of Hildale are at risk of being lost altogether in tax sales if the back taxes on the properties aren’t paid. On the Arizona side of the border, UEP-managed properties could be sold off by the state to investors as early as February because the taxes on the properties will be five years past due come 2015. Wyler said court-appointed fiduciary Bruce Wisan, longtime overseer of the UEP Trust, narrowly avoided losing the commercial property where an FLDS-run grocery store once operated in Colorado City. He was able to sell the property to a private buyer just two weeks before the property was set to be seized permanently by the lien holder. Wisan used the money from the sale to pay off some of the back taxes owed by the UEP, Wyler said. The grocery store building has since been converted into a hardware store. With the threat of additional properties being permanently lost in the very near future, evictions must take place when occupants refuse to pay their taxes and the UEP fees, Wyler said, and new residents must be brought in who are willing to pay the taxes and either obtain deeds to the properties or pay the court-mandated occupancy fees. The tragedy, Wyler said, is FLDS members believe their taxes have already been paid because they gave the money for the taxes to their church leaders. But whatever church leaders did with the funds, they didn’t pay them to the government. Wyler said more and more FLDS members are leaving the religion and finding that out the hard way. 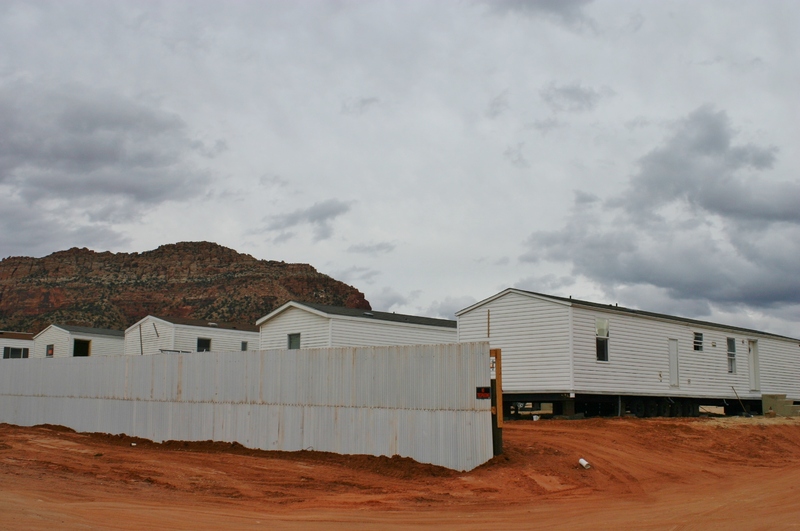 This summer, 3rd District Judge Denise Lindberg ordered eviction proceedings to begin on a handful of Hildale homes – 16 in all – for which the occupants were delinquent on taxes and ignoring the court’s mandate to pay the $100 monthly occupancy fee. “Basically, she wants a working relationship with every property within the trust,” Wyler said. Of the initial 16 homes, the occupancy of two properties was able to be resolved without eviction proceedings; for the other 14 homes, the eviction process went forward. Some occupants packed up and left of their own accord after being served the early notices. 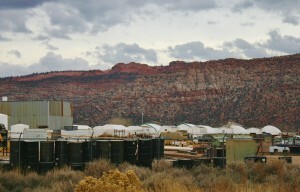 In other cases, there have been delays, Wyler said, including residents claiming an occupant of one home was a deployed military member and, therefore, could not be evicted – ironic, he said, since the FLDS church is oppositional to the federal government and the church’s members don’t serve in the military. But because occupants made these claims, it became necessary for the UEP to refute the assertions and prove they weren’t true, further lengthening the eviction process. In one case, Wyler said, a home that had been vacated was later found to have been taken over by “homeless” FLDS members – some of them young boys – who had lost their homes and families as a result of church discipline. The individuals were sleeping on mattresses on the floor of the home, some of them without blankets. When their living conditions were discovered and help was offered to them, they refused it, Wyler said, even leaving donated food boxes untouched. Though they had been bumped to the bottom of the FLDS totem pole, he said, they were still loyal to and under the thumb of FLDS leaders. Eviction proceedings for the first batch of homes is now concluding, Wyler said. On Dec. 5, constables enforced evictions on seven of the 14 homes, and the locks on the homes were changed. Earlier this week, the same was done on the seven remaining homes. “Additionally, there are going to (be many) more evictions,” Wyler said. Wyler said commercial and residential evictions are being handled separately, and approximately eight commercial properties have been repossessed so far by the UEP. One of them was the former Meadowayne Dairy, which was reclaimed by the UEP on Nov. 5 after months of notices being served and battles being fought with local law enforcement. Wyler said when he first attempted, on behalf of the UEP, to take possession of the dairy property in October, the local marshals arrived and threatened to take him, a cameraman and even the locksmith to jail for doing so. So, the second time around, Wyler was backed by Mohave County Sheriff’s deputies when he arrived to have the locks changed on the property. A large crowd assembled near the dairy when the locks were changed, he said, but with the deputies there, the process was completed without much incident. Despite the hubbub over the dairy being seized, the irony is that the dairy’s owners had vacated the property months before, he said, removing all their livestock and completely abandoning the building rather than cooperate with the UEP to remain on the property and keep the dairy functioning. 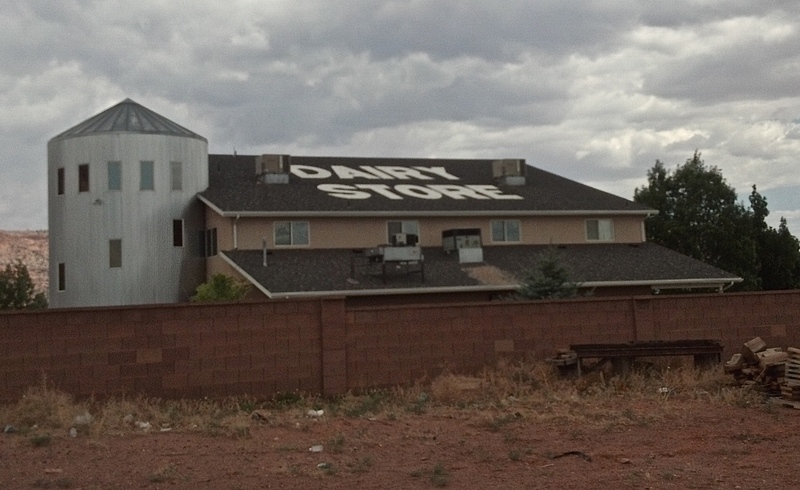 The day the dairy’s locks were changed, employees at the Dairy Store, which is located down the street from the dairy and still currently in operation, said they believed the dairy was being seized as an act of persecution against the FLDS people and that no eviction notice had ever been served. As more evictions are served and new occupants take up residence in the seized homes and businesses, Wyler said, the border towns of Colorado City and Hildale will continue slowly transforming into a new community. “At the rate it’s going, within two years we’re hoping it will be a totally different town that what it is now,” he said. Tents huh? Maybe they’re planning to put on a circus…? They are under the false impression they can generate a media circus sympathetic to their plight. This reminds me of home except we use black tents and wat for UNICEF to feed us. There is a shortage of higher reasoning powers . How much taxe is owed. I wouldn’t mind owning that place, taking over those business and putting those hard working pligs back to work. Looks like things have finally worked out they way Warren had it planned, if he has to suffer so does his people. By Their Fruits ye Shall Know Them, weither they be good or weither they be evil. As for Warren and his family looks like they decided to service the same master as the wanna be biker gang. Only difference between the two the plig gang would win that fight. Ok Mr Potter, we know you “you wouldn’t mind owning them businesses and homes…” . We need to reduce the surplus population…FEMA tents for all, soon they will labels LDS as a right wing fundamental terrorist radical faction any excuse to round up these radicals into the compound with you. What everyone misses is that these camps are popping everywhere and contracts are being drawn up. So if money you got than oppertunity abounds (Wackinhut) is getting many connections and contracts…going be hard. Many of these dry runs are tests and these camp go up quick and will be used for other purposes. So much happening right now…. Could you elaborate and provide more information about the camps “popping up everywhere” and “contracts being drawn up”…sounds like we need to know more about this, but please make it solid information and not just conspiracy stuff. 2nd thought / question . . .
Are these behaviors by any chance the result of the inbreeding ? NO ITS AN FLDS TRAIT NOT A MORMON TRAIT!!! They are reading from the same book. Wasn’t one of their biggest supporters a Utah Attorney General, also a mormon? Are these people related to Cliven Bundy? I can’t wait to see what KOOLAID has to say about this. I am sure that in some way the Mormons are to blame. Or so he says. I’m waiting to see how mormons will blame Obama, Democrats, Liberals and the Federal Government. And to think we ALMOST had a Mormon president! You’ve GOT to think about things like that! The Mormon Church is the one who REMOVED THE TV SHOW FROM TLC – ESCAPING THE PROPHET! HOWEVER, TLC WAS FREE TO AIR ALL 6 EPISODES IN OTHER COUNTRIES BUT “WE” HERE IN THE US AND CANADA COULD NOT SEE ALL 6 APISODES! The Mormon church is TRYING TO KEEP “US” IN THE DARK!!! WRONG!!! You mean the guy who got beat by Obama twice with less than 47 % of the vote? NO NO NO NO there is a huge differance in flds and lds trust me on that I am mormon and we DO NOT PROMOTE POLIGAMY!!! It is sick and wrong!! SO GET FACTS RIGHT GUYS COME ON!!! You belong to a cult. Admit it and get help. No he wasn’t. Check your facts, Vet. I am thinking that maybe Adolf and the other Germans might have been on to something, especially when I see all you hateful mongol humans spouting your cursed tounges. Yes they fell short of a few billion souls. If we would have gotten MIT we would have been a lot better off, I mean us this better? Lauriehere lets see if if you have the courage to make this debate fair. What religion are you ? than we can compair rather than attack one. They all have skeletons in the closet . You sound nieve . I’m sorry you missed -escaping the prophet and it left you in the dark. is the catholics still hiding it’s pedifiles? I was wrong about Hitler , he was babtized catholic . The DNA from close relatives showed that he had distant relatives who where African Jews . It is hard to believe that in this day and age, people can be so mind-washed that they become totally brainless and unable to think for themselves. This is truly Satan at work here. Satan taking the form of Jeffs, FLDS, and the town fathers. I do believe in religious freedom. UP TO A POINT. When that point puts at risk, children who have no choice, and adults who are not playing with a full deck, then it is time for CPS and APS to step in and remove those people to “safe” locations. Are we likely to have another Waco here? It wouldn’t surprise me a bit. This has been brewing for many years, and I don’t believe politicians are going to ever fix it, any more than they can fix anything else. Again, please provide more information on “Muslims out there practicing Sharia Law mutilating little girls here in the USA while killing us.” Give us a website or some reference we can use to learn more. And again, please be sure it’s solid and not just conspiracy or talk radio stuff. Hmmm…Those quotes may easily apply to another church in the area as well. I’m pretty sure the “other church” your referring to allows its members to use the internet, read what they want, and investigate for themselves. Quite the difference from the current situation in Colorado City where Jeffs threatens to take away homes, family and livelihoods if your caught looking at the internet or reading a piece of mail. Inbreeding pedophiles sometimes reap what they sow. That was a great article, Cami. Well worth reading. I cannot imagine living under this type of psychotic, self-serving, dominion. They are terrified out of their own minds. It’s not stupidity, it’s generational brainwashing. It’s torture and total ostracization if they stray in even the least way. Ya gotta remember, all the free thinking men were excommunicated and thrown out of town years ago. What is left are men who are afraid their kids will be sexually abused by ‘stepfathers’ if they are also driven off, or worse. So how long will DCFS, the health department, the sheriffs and other agencies who are sending these parents thousands a month be silent about the living conditions for these families? If I had one of the notices I think I”d stand in the center of town with a bullhorn and read it on blast. This has got to be stopped…now….today….before they are more beat down and pull a Jonestown move. YES!! Do your research, Boyd. The leaflet drop might be effective….that’s how communication/propaganda is disseminated in times of war, and this is definitely war. Including them in radio broadcasts might as well…every car has a radio…word would get around. Something has to be done. Arizona and Utah, Washington Co, and Mohave Co have to blame themselves for turning a blind eye to this for a few generations. Allowing Jeffs to rule so long was a big mistake and eviction is their easy out but not foolproof. Even this ordeal is costly and will probably screw up more minds. Jim Jones ring a bell? I’m just asking – why do you think a blind eye was turned on this for so long? What’s changed now? I don’t think Isaac Wyler knows what a concentration camp is. Oh the bitter fruit of Mormonism. All part of what seems to a systemic refusal in this part of the country to pay taxes, abide by the law. There’s a strange and creepy “create your own government” attitude and brainwashing seems way too easy. Too much sun or what? The FLDS and the Cliven Bundys are all cut from the same cloth – won’t pay taxes, won’t abide by the law, will create their own governments…This is no coincidence – it’s a way of thinking. And it began with J. Smith and his arrogance toward the U.S. Government…these factions have all spun off from that. Hey, anybody here ever hear of the Walla Walla Jesus? Another loony LDS off-shoot though not quite as dangerous as Bundy and the FLDS desperados. Bizarre. Do your research. Bundy tried to pay the fees of the contract they had in place for years. Because he wouldn’t sign a new contract that was bad for the land and surrounding area the BLM refused to accept it.. He just refuses to comply with anything or anybody but his own divine revelations and pig-headedness. He’s no hero standing up for what’s right. He’s an arrogant liar and a lawbreaker standing up for what’s wrong. And whether he likes it or not, that land is still in America. He still lives in America. And his cattle are still in America. If he wants to leave America and start his own country, fine. Until then he either pays his fair share as an American or takes the consequences. It’s sad to see this. I feel for the people, but they do need to pay their taxes. On the other hand I see all of the vile hate-filled rhetoric from some of you on here and I cringe. Some of it is just pure hog-wash, that if you actually did your research you’d realize how wrong you are. Maybe this will give the state a place they can raid. CPS can then take all the kids and return them to responsible parents. My instinct is that that state will have to ‘respond’ rather than ‘initiate’ action up there. If they raid that town you will see another round of lawsuits like those that happened in Texas. If they respond to the onset of illness reports, or the death of someone related to conditions there, that would be different. No one up there (active FLDS) trusts authorities enough to make an abuse report so it’s likely going to take a while. Yep, and without beleaguering the point advanced notice of a raid is exactly what incited the other cult to self-destruct (kool-aid). To respond to the question you asked about timing. Yes, these abuses have gone on for generations but laws have changed, so has exposure. Both have created an atmosphere of compassion for the 12 year old girls up there who have been ordered pregnant and the hoards of families living in tents. This situation needs to change….and the people up there need to understand that humans have value…even though they have been taught otherwise. Listen guys, I am Mormon and I will say THAT WE DO NOT BELIEVE IN POLYGAMY!! ITS SICK AND WRONG!! FLDS are brain washed from the time they are born they do not know any different…I actually feel sorry for a lot of them because they are so clueless as to whats going on. Well the men know whats going on but its the women who do not!! I am LDS And we are not out to keep people in the dark. We help people from all religions regaurdless of who or whats going on. We have catholic, christian, baptist, My church helps others and thats what we are all about. I pay my taxes my family pays theirs to……FLDS people are not associated with the LDS!!! Were the FLDS people came from is when Joseph Smith restored the church, and those men that wanted more than one wife (perverts) brain washed women to join them instead of the LDS church. Because they did not want to believe in the Mormon Religion. so please do not get the good Mormons confused with the perverts!! You surely can’t believe your any different from the Flds. It is amazing how ignorant you mormons are. The only thing not in common is the length of your garments. RIKI, I want to give you a hug, tuck you in bed, and kiss you on the forehead goodnight so you can continue to dream on that the there is a huge difference between the FLDS and the LDS, Staying asleep helps with the cognitive dissonance that you are experiencing. Bless your heart! WOW -Your big fancy words indicate a limited intelligence but you muck that up in your attack when you use sarcasm you show just how weak and little you are. One more thing, Are you Muslim? Then why can a man be sealed to more than one woman in the temple for time and all eternity…but a woman can only be sealed to one man? Great…so a Mormon woman who’s managed to hold onto her man in this lifetime still has to wonder if he’ll want to be sealed to that cute waitress at the truck stop for – wait for it – Eternity! while she’ll just be stuck with the same old guy forever. These patriarchal religions are so unfair! Ill be live that when the lds church, i mean “state”, of Utah actually does something about the rampant pedphilia down there. The FLDS religion is a branch off of the LDS religion. So you guys are the ones who started polygamy, now you guys just feel guilty and ashamed of it so you hate on it. Once upon a time almost all Mormons were polygamists until some people decided that it was wrong and others were all like no it’s right. So that’s basically how you two split apart. What I think (my own opinion) is that the reason why you guys started polygamy is to restore your religion. Because your religion was hated on so much when it just started out and then you guys basically re-located to Utah. Your population wasn’t very big though, so you were all like hey I know what we can do….. and then Boom! Polygamy! you guys STARTED polygamy In the united states. And it was just to have more people around that believed in your religion. You needed a bigger population to “carry on” your religion. And that’s how it is with almost every religion, they always need more people, because the less people within a religion, the lower the chance of it being carried on. And trust me… Im not blind to the Mormon religion. I live here in st.george and was in a Mormon foster home. I was FORCED into the religion. I know what the religion is, and it’s beliefs. Cami, have you called Child Protective Services to report the children being housed in tents during the winter? I would think as a mandatory reporter, you’d be obligated to do so having had first hand knowledge of this. Keep us updated on our families there please. But your Mormon prophet promoted polygamy and was persecuted the same way as the FLDS are….whats so different???? Riki if you check your history Joseph Smith started polygamy and Brigham Young carried on with it. If you and your friends bought some land and started a trust. How would you feel if the state came in and removed your trust manager and put someone else in charge? And on top of that started charging you occupancy fees? Personally I think the state needs to admit they screwed up for getting involved in the first place. Uhm, Zack, talk about Why the trust manager was removed. Somehow the Why always gets ignored. He doesn’t know. He only can repeat what the church leaders have told him. These are NOT concentration camps! What a terrible misuse of words. No one is being marched to ovens or gas chambers, ferried by trains to death camps, or put in gray uniforms and forced to do harsh labor work. I do find this reference highly offensive and ignorant by this newspaper. If anything this is a “squatter’s camp for inbred FLDS sheeple” geez! You’re right – not a concentration camp. I think the person who said this was thinking “internment camp” like places the Japanese citizens were sent during WW 2. There was one in Utah. For all of you scholars out there that prove to the world with every comment you make, that you graduated from the university of stupidity. Let me help you out in your confused state. Plygomy stated with the prophets in ancient times. Abraham, Isaac , Jacob, king David, king Soloman to name a few. I relize there are a lot of folks that don’t believe in God and the Bible that’s fine they have the excuse of ignorance. Any one professing to be a believe in such needs to study a little more. For God is the same yesterday today and for ever. Polygomy a practice set in motion by the creator why? doesn’t matter. You could ask why did he create stupid people. It’s only when men take it upon themselves to take more than one wife where the problem arises. Again study King David and King Soloman lives to understand how they failed. So proper authority has to be given of God, to determine the correct practice of the order. How do we know when that proper authority is being used. First we have to live in obedience to the commandments of God then the Holy Spirit will confirm to us what is true. It’s also clear by scripture as it states, by their fruits ye shall know them, weither they do good or do evil. Now go look in the mirror and answer for yourselves do I promote good or do I promote evil. For there is a lot of rotten fruit on this St. george News comments everyday. Maybe some of that’s polygamist pillow talk. interesting the hatred toward FLDS and LDS on this forum are disturbing, I am sure all you good Christians out there have a hatred that is acceptable to God. Why I am certain that those with such hatred were found persecuting and stoning the Prophets of old. Murders in your hearts, With a desire only to spread whatever hatred you have through half truths and lies. Getting joy from the suffering of others. God is just and he alone will judge. Not you. No one on this board cares enough to waste their energy towards hating LDS or their spawn, the FLDS. A short tally of the Haters here will reveal a very small number who post frequently. Many Forums prohibit, and remove posts of a malicious nature. I suggest the same here. Nearly every thread devolves into mindless frothing. This is not a “concentration camp”. This is a refugee camp, no different than you might find in countries where minorities persecuted. A camp created to house victims of persecution. The most ignorant group is not FLDS members who Wyler and the media lie about daily, but the people who believe those lies. FLDS members know what is going on in the outside world, they just choose not to associate with those doing the persecuting. Very simple really, would you want anything to do with those harassing you, making fun of the way you choose to live, slandering your people and family? The media constantly portrays the average FLDS member as ignorant, kept in the dark by Warren Jeffs, etc. That is simply too simplistic and the fact their readers and viewers believe that to be thr way FLDS members are show their own ignorance. FLDS members would rather be a wandering tribe in the desert with no property than a slave with property to those who interfered so much with FLDS lives and communities.